100 PACK - BE AN APOSTLE! A pocket-sized card that explains the importance of the correct pronunciation of ecclesiastical Latin - citing Pope Pius XI, who in turn cites Popes St. Pius X and Benedict XV. Get packets of 100 for use in school or passing out to parishioners. Pocket size, black and red ink. Update your Missal to 2040 AD with this handy fold-out chart designed to fit into your Missal. Shows the dates for Easter, Ash Wednesday, Ascension, Corpus Christi, Septuagesima, First Sunday of Advent, Pentecost and the number of Sundays after Pentecost. Contains: Prayers after Low Mass, Our Father, Hail Mary, Glory be, Angelus, Regina Coeli, Salve Regina, and Prayer to St. Michael the Archangel and the Prayer to St. Joseph. All in Latin, except the Prayer to St. Joseph. Includes prayers for Benediction in Latin and English. There are three types of Baptism. No, I am not talking about water, blood and desire. Nor am I speaking of immersion, infusion and aspersion. For a normal infant baptism (infusion with water, technically speaking), I have witnessed, "chaotic baptism," "clueless baptism" and "orderly and intelligent baptism." What, you may ask, am I talking about? In "chaotic baptism," there are generally a bunch of people and the priest shows up with two or three rituals - all of which are shared, tugged at or fought over by the attendees. At a "clueless baptism," there may be a few rituals present, perhaps some St. Andrew Daily Missals (with its incomplete Rite of Baptism) and those who are not fortunate enough to have one of the above stand silently and make as much sense of things as possible. Lastly, "orderly and intelligent baptism." There is one essential ingredient, and that is that everyone in attendance have a copy of the Rite of Baptism in English and Latin. There are two sources for this. Ideally, one would flip to the Rite of Baptism in Angelus Press's 1962 Roman Catholic Daily Missal. Ahh - perfect. The whole rite to follow. You can even share with a neighbor...but hopefully not three or four! Not everyone has the 1962 Roman Catholic Daily Missal, particularly guests who do not regularly attend the Latin Mass and so we have produced Baptism, which contains the entire Rite of Baptism. Ideally, the church should make them available for use at baptisms, but otherwise, bring your own. Everything you need (and not just for observers, but also parents and godparents) is there. They are inexpensive enough that everyone can have one and fully concentrate on the rich ceremonial the Church provides for creating new members of the Mystical Body of Christ. Simply, I don't think I have ever been to a baptism where I would not have bought one of these books for everyone present, just so people could pray along with the Church with these beautiful prayers. EVERY CHURCH AND CHAPEL SHOULD HAVE THESE AVAILABLE TO THE FAITHFUL! Chapters include: On Holy Baptism by Fr. Franz Schmidberger, Church Teaching About Baptism, The Ceremonies of Baptism, The Serious Obligations of Godparents, The Churching of Women, Blessing of a Woman after Childbirth and of Her Child, Consecration of a Child to the Immaculate Heart of Mary, The Rite for the Baptism of Adults, The Reception of Converts. By Bishop Fulton J. Sheen. 1)The Confiteor: Father, forgive them, for they know not what they do. 2) The Offertory: Amen I say to thee, this day thou shalt be with me in paradise. 3) The Sanctus: Woman, behold thy Son...Behold thy mother. 4) The Consecration: My God, My God, why hast Thou forsaken me! 5) The Communion: I thirst. 6) Ite, Missa Est: It is finished. 7) The Last Gospel: Father, into Thy hands I commend my Spirit. Bishop Sheen says, "Hence the Mass is to us the crowning act of Christian worship. A pulpit in which the words of our Lord are repeated does not unite us to Him; a choir in which sweet sentiments are sung brings us no closer to His Cross than to His garments. A temple without an altar of sacrifice is non-existent among primitive peoples, and is meaningless among Christians. And so in the Catholic Church the altar, and not the pulpit or the choir or the organ, is the center of worship, for there is re - enacted the memorial of His Passion." (from the Prologue). Michael Davies shows that Henry VIII and Thomas Cranmer understood that if you change the way people pray, then you will change what they believe. Cranmer's Book of Common Prayer (1549) began a process that changed the Catholic Church in England to the Anglican sect. Davies compares these changes to the modern liturgical "reforms" and the similarities are shocking. Cranmer's Godly Order is a classic...revised and expanded by Mr. Davies during his final years. Drawing upon the best of Catholic and Protestant scholarship and on primary sources, Davies traces the steps by which the ancient Catholic Mass became the Lord's Supper in the Church of England. And these steps were changes - as Popes and Reformers alike were at pains to stress. Thomas Cranmer, Archbishop of Canterbury under Henry VIII and Edward VI and architect of the new liturgy, was a master of the theology of the Mass, and hated it. The parallels between the Anglican liturgy and the New Mass of the 1960s will be uncomfortably obvious! This book forms volume one of Davies's Liturgical Revolution series with volumes two and three due out by the end of 2008. Nowhere will you find a more thorough example of the axiom Lex Orandi, Lex Credendi est - "As you pray, so will you believe." Cranmer's Godly Order sets the stage for the next two books of the Liturgical Revolution trilogy of which Volume Two (Pope Paul's New Mass) is again available. What does it gain a man to have his whole life perfectly organized but to lose his soul? It's so easy to lose sight of God in our busy world. But the Church gave us the answer from the very beginning when she structured her official prayer around a framework of the psalms prayed eight times a day so that within one week, all 150 psalms are said. Here you have the most critical hours of the Divine Office for the layman in the world. Prime is the perfect Morning Prayer, Compline the perfect night prayer, and Sext is for the middle of the day. This is better than private prayer; it's the prayer of the entire Mystical Body because you pray with one heart with the millions of other clerics, religious and laymen around the world who have prayed and are praying these exact same prayers, AND because you adopt the intentions of the psalmist as you pray. When understood correctly (this edition has a short explanation preceding each psalm), these are the intentions for which Holy Mother Church wants us to pray for ourselves, for the Church and for all the members of the Mystical Body of Christ. Our Lord, our Lady, and the Saints prayed these psalms. •Melodies in Gregorian notation for those who chant the office in common. •In timeless Latin with parallel English translations. Includes everything for the Hours of Sunday Lauds, Prime, Sext, Vespers, and Compline; Prime, Sext, and Compline for each other day of the week. Individually shrink-wrapped. Latin pronunciation guide bookmarker included. 221pp, leatherette sewn hardcover, 2 ribbons. Assist at the Sacred Mysteries with precision. Pictures of the sacristy, sanctuary, sacred vessels, and vestments. Teaches the necessary Latin (with pronunciation guide) and the movements (profusely illustrated) and responses for serving Low Mass according to the 1962 Roman Missal. Requiem Mass, Mass in the presence of the Blessed Sacrament exposed, Low Mass with 2 servers, and Benediction also covered. Unique in that it strongly focuses on the Sacrifical aspect of the Mass. The first seven pages are dedicated to explaining "What is a Sacrifice?" The remainder of the book focuses on each part of the Mass explaining it in simple, doctrinal terms along with 39 brilliant illustrations by classic St. Andrew missal artist, Joseph Speybrouck, each with its own explanation. Each illustration has three parts. In the foreground to the right, we see the action of the priest via the "pew-view." To the left, we see a close up image of the priest. In the background, is an historical or eschatological image depicting the action at the altar or the prayer being said. This organ accompaniment book contains the necessary Kyriale Gregorian chants for the Kyrie, Gloria, Credo, Sanctus, Agnus Dei, Ite missa est and more! This is a must-have for organists who play for the traditional Roman Mass! This organ accompaniment for Gregorian chant has in modern notation all of the standard Kyriale modes (I - XVIII), the Credo modes I-VI, and the Asperges (including one ad libitum) and Vidi Aquam modes. Includes responses made during sung Mass (e.g., Dominus vobiscum for the Preface, the Pater Noster, etc.) in both solemn and ferial tone, and even the pontifical blessing as given when a bishop celebrates. And for choirs that are not proficient enough yet to sing the propers of the Requiem Masses a cappelo, Bragers provided the accompaniments for their propers and Kyriale and the other funeral functions; i.e. : the entrance of the casket into the church, the absolution ceremony, and the In Paradisum. Of course what accompaniment manual is complete without supplying some of the ad libitum modes for the Kyriale? Bragers published the cantus ad libitum modes for I - XI of the Kyrie, I - III and more ambrosiano of the Gloria, I - III of the Sanctus, and I & II of the Agnus Dei. The organ notation is underscored by the Latin words, hyphenated under each appropriate note (which assists with proper pronunciation). 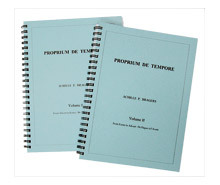 Fully indexed, all notations and text are in printed in black ink on medium stock paper to ensure durability, while the comb-binding gives the organist easy and quick access. 164pp. 101⁄2 x 71⁄4. Durable comb-bound cover. Lefevbre (in three volumes). The current president of Una Voce is Mr. Leo Darroch. Ordinary of the Nuptial Mass with Marriage Ceremony and the Nuptial Blessing in Latin and English. With Instruction before and after the Marriage ceremony. An instructional aid for those learning to serve the Tridentine Latin Mass (low Mass only). Serving at Holy Mass is a time-honored privilege for Catholic young men. The Altar Server has the opportunity to assist the priest at the Holy Sacrifice of the Mass by reciting prayers and performing functions which are usually reserved to an ordained Acolyte. Because serving at Holy Mass is such a sacred act, it is important for the Altar Server to learn his duties well and to perform then with great reverence and devotion. Serving at the Altar will assist the Altar Server in two very important ways: Latin pronunciation and proper actions within the sanctuary. The CD for Latin pronunciation and the booklet for server's training are meant to be used together. Reviewing this material often will help the Altar Server remember his important and sacred duties and make his actions at the altar an edification for the faithful who see him and a special blessing for himself. Includes a 52 page booklet, audio CD and a laminated serving card. All in a molded plastic case with color jacket. seasonal feast days, such as the Introit, Gradual, Alleluia, Tract, Sequence, Offertory, Communion. First published in 1947, this organ accompaniment book has in modern notation all of the seasonal propers for the liturgical year. Throughout the entire book, the organ notation is underscored by the Latin words, each hyphenated under the appropriate note. ensure durability, while the spacious comb-binding gives the organist easy and quick access. A compact history of the Roman rite of the Mass from the Last Supper to the missal codified by Pope Saint Pius V, the so-called Tridentine Mass. Describes the historical development of the rite, and encourages the faithful to remain faithful to it. The spiritual inheritance of every Catholic. The four volumes correspond with the main divisions of the Church's Year, giving to our generation the sermons preached to the men and women of the time by the great Fathers and Doctors of the Church. Multiple sermons on the Sunday Gospels and on the great Church Feasts by the greatest preachers of the Catholic Church address the same problems Catholics face today. Their teaching on the Gospels will add clarity and depth to understanding key passages from Holy Scripture. With parallel text from the other three Gospels, and an explanation of the Gospel from Saint Thomas Aquinas's Catena Aurea. Rich in Patristic spirituality - Timeless. 1,844 pp, Color hardcover with gold embossing. achievements of Western civilization stem from the old creed. Without the one, the other would not exist. The book our readers wanted. The BEST questions and the BEST answers of 30 years of The Angelus are printed in this hardback edition. This will be a family's heirloom reference book for everyday Catholic living to match the Catholic Faith it believes and the Latin Mass it attends. NEW EDITION FEATURES INCLUDE: SEWN pages, litho-wrap printed HARDCOVER, and high quality CREAM colored text pages! A family heirloom to last generations! The perfect book for family reading. Part I: texts and commentaries for the Epistles, Gospels, and most other Mass prayers (e.g., Introit, Collect, Gradual, etc.) for every Sunday and Holy Day of the liturgical year. • More Hows? Whys? and What-fors? 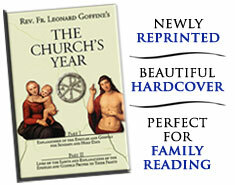 The Church's Year follows the calendar in effect at the time it was first published (1880), yet nearly all of it is applicable with the use of the 1962 Missal. Totally re-typeset. "It will bring blessings on any house in which it is kept and used." -Wm. Henry Elder, Archbishop of Cincinnati, 1884). 814 pp. hard cover (printed litho-wrap), sewn signatures, cream paper. characteristics of romanitas effects the various intricacies of the sacred ceremonies. This abridged edition explains the principles that specifically affect the inferior ministers (altar servers) when fulfilled by laymen. two glossaries of terms (sanctuary-related and rubrically-related) used within the book. Whether you have never assisted at the ancient Roman Rite of Mass or have been doing so your whole life, this book has plenty to offer. The neophyte will be forever indebted to Providence for having put this book in his hands. As for the "veterans," you'll be left wishing you had read this book decades ago. Are you fervent in your faith? Fr. Dunney will give you a greater depth of understanding. Are you lukewarm? Let Fr. Dunney pull you out of the spiritual doldrums. You don't get anything out of Mass? Then, read this book. Our challenge is to understand the Mass, participate in it and live by its lessons. Fr. Dunney will help you on all counts. Intellectually, by offering an authoritative explanation of the Roman liturgy, explaining every part of the Mass carefully and in depth, highlighting the priest's role, vestments, altar vessels, and symbols. The text of the liturgy is presented in both Latin and English along with unique and fascinating insights into the history of the liturgy and the Church. Loaded with examples from Holy Scripture and the lives of the saints, Fr. Dunney applies the lessons of the Mass to help you grow in virtue and character for a fuller spiritual life. More importantly, he will lead you to a true participation in the Mass, which is nothing less than the union of the soul with Christ as He represents on the altar the Sacrifice of Calvary. Not accessible to the average Catholic, you say? Too mystical? Think again. Liturgical scholars and authorities are quoted throughout and 126 illustrations help to clarify important points. Each chapter ends with a series of review questions. Ideal for study, classes and homeschooling. The Mass is equally useful to the priest, seminarian, student, or layman. Written by Fr. Joseph Dunney, the author of our popularly acclaimed The Mass, which we reprinted earlier this year. This book was penned specifically with boys and girls in mind. Fr. Dunney speaks on lofty subject matter, but on the child's level, so that young minds can grasp the grandeur and mystery of the Holy Sacrifice of the Mass (1962 Rite). A valuable read for every child (Ages 8-12). 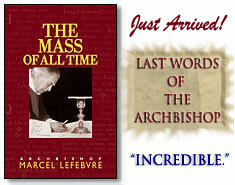 The Mass of All Time is a collection of Archbishop Marcel Lefebvre's sermons, classes and notes on the Holy Sacrifice of the Mass...a compendium of what he taught on the Mass - its rites, spirit, prayers, theology, spirituality, and grace. Many of these texts have never been published before. Fr. Patrick Troadec, rector of the Society of St. Pius X's seminary in Flavigny, France, collected and organized the Archbishop's manifold writings and speeches on the Mass and presents them here, in two parts. Part one is a running commentary, gleaned from all the works of the Archbishop, on the prayers, parts and actions of the liturgy. Part two covers the New Order of Mass promulgated by Pope Paul VI in 1969 and includes commentary on liturgical history, the liturgical revolution and the history of the SSPX's defense of the old and rejection of the new. Again, the words are those of Archbishop Lefebvre, woven together by Fr. Troadec. The Archbishop is known for his courageous defense of the Tridentine Mass but never before have his insights been collected in such an accessible and complete format. Especially now, with a renewed interest in the "extraordinary form" due to the Holy Father's motu proprio, this book is ideally timed because it is primarily a "positive" book coming from him who is too often known as the "Rebel" or "Renegade" Archbishop. Here we see the love and depth of understanding that Marcel Lefebvre had for the Mass of all time. Polemics are not excluded, but they take a back seat in this volume. With the release of the motu proprio, it seems there has never been a more ideal time for traditionalists AND those new to the "Old" Mass to see this side of Archbishop Marcel Lefebvre...indeed, the more important side as it was his love of truth and the Mass as handed on to him that fueled his battle to defend it. The following review by the internationally recognized liturgical scholar, Dr. Alcuin Reid is well worth a read. Archbishop Lefebvre has been the great 'persona non grata' of the modern Catholic Church. Now that in the pontificate of Benedict XVI we are more or less 'speaking again' as it were, it may well be time to look anew at what the Archbishop had to say in that tumultuous period of the Church's recent history which was the late twentieth century. Angleus Press has published a compilation of the writings and discourses of Archbishop Lefebrve on the theology and spirituality of the Mass and on the liturgical reform that followed the Second Vatican Council. The former has value as a compilation of classical spirituality. The latter - of particular interest personally - puts together the Archbishop's observations on the liturgical reform. How many people know that he was in favour of the vernacular for the readings at Mass, and indeed for most of the first part of the Mass called the Mass of Catechumens? And how many know how and when he began to react against the implementation of the reform enacted in the name of the Council, of which he was a Father? One regret is that the editor has compiled the second part of the book thematically and not chronologically: it would, in my opinion, be more useful as historical material in the latter format for, thematically arranged, it is too easy to read on without noticing that at times the footnotes indicate a jump of many years back and forth. The Archbishop speaks forthrightly. Indeed, there is language here that is clearly polemical and perhaps even reactionary: the years in which he raised his voice were extraordinary times and we may well find that we do not agree with the words he chose or the decisions he took. We may even quibble with his recollection of events or debate his understanding of theology. Yet, in days when honest dialogue and reappraisal of the events following the Council are now permissible, it is instructive to have Archbishop Lefebvre's words to hand. Unfortunately Archbishop Lefebvre never lived to see Pope Benedict's liberation of the more ancient form of the Mass in July 2007. But as the usus antiquior gradually claims its rightful place in the Church of today and of tomorrow we would do well to consider that - humanly and historically speaking at least - it may not be able to do so today were it not for the reaction of the Archbishop and of his disciples then. For the Providence of Almighty God we may be thankful. The holy Sign of the Cross is the most important prayer and symbol of our Catholic faith. It is at once the image of Christ's passion, the sign of the redemption of all mankind, the awesome testament of the destruction of the power of the devil and of his kingdom on earth. The resurrection is the promise and seal and guarantee of eternal life which consummated the work of the Cross. Christians rejoice and the demons tremble to see the Sign of the Cross emblazoned everywhere as proof of Christ's victory over the world. Christ said "all power is given to me in heaven and on earth" and the Cross is the seat of that power. There is no place on earth where a person who makes the Sign of the Cross is not immediately recognized as a Catholic, and there is no miracle that has not been worked under this sign. It is the "nuclear bomb" of prayers and with it the faithful can clear away all enemies and temptations with the simplest of wordless gestures. Msgr. Gaume has compiled a magnificent collection of history and commentary from the saints and fathers and doctors, as well as his own meditations and exhortations regarding this most powerful prayer. An entire book on the Sign of the Cross might seem boring - trust me, it is absolutely fascinating. You will never make this holy sign in haste again.